The second half of 2008 has long been considered a very uncertain period of transition for Palm. The embattled handheld maker will presumably be attempting to tread water on the residual sales of the popular Centro smartphone alongside a handful of new Windows Mobile-powered devices, all while presumably prepping the Nova OS for release sometime in 2009. What exactly Palm's upcoming Windows Mobile device lineup looks like remains the most pressing question facing the Palm faithful as we kick off the beginning of the summer months with just a small handful of rumors to contend with. As usual, all of the information presented here combines a great deal of speculation based largely on Palm's past releases plus a handful of leaked images, specification and online chatter. Of course, we've had a few leaked images, roadmaps, and specs over the past year to go on as well. All of the content of this article is essentially speculation and conjecture based on Palm's traditional device history and should in no way be interpreted as an actual Palm release schedule. For references purposes, this site has a handy repository of nearly every Palm device ever released with their internal codenames. Notes: Introduced in September 2007, the Treo 500 remains a Europe-only device due to its tri-band GSM radio. The Treo 500 is Palm's first "outsourced" smartphone with Asus being Palm's ODM. It is unlikely to ever see the light day State-side. I am including it here just for reference purposes as this is Palm's most recent WM-based product to date and looks to be the basis for one or two future WM-based devices from Palm. Notes: This fabled device (AKA the "Mercedes Treo" mentioned by Ed Colligan in late ‘06) has been making the rumor rounds for well over a year now and is approaching legendary status. While official specs have been very slow to emerge, the general consensus is that the device will be powered by Windows Mobile 6.1 Professional, have a 320x320 recessed touchscreen, a ~400mhz CPU and 128mb of RAM with 256mb of ROM. It should also achieve a series of notable milestones, such as Palm's first EVDO REV-A handset, Palm's only GPS-enabled device, and Palm's first smartphone with integrated wi-fi capabilities. Bluetooth 2.0 with A2DP and a 2.0megapixel camera round out the hardware specs. The device will also supposedly utilize a new proprietary connector and features a 1500mAh battery in a formfactor similar to the current Treos but a bit wider and flatter. It is expected to debut with Sprint on July 22nd in black and appear several months (possibly six, according to a TreoCentral user who spent some hands-on time with a VZW beta test version) later in a metallic burgundy color scheme on Verizon. This is the device widely assumed to be undergoing beta testing by Sprint users, per our earlier coverage. Controversy is still raging as to the device's exact specs, with some speculating that GPS, Wi-Fi, or EVDO Rev-A may be disabled in the device's initial firmware, based on this post revealing the 800w's DSLReports performance with Mobile Internet Explorer 7.11. Some additional 800w details, presumably posted by someone in violation of their NDA, appeared several weeks ago on the TreoCentro/WM Experts 800w forum but were quickly pulled without further explanation. Evidently, these posts contained specifics about the device's appearance and its battery capacity. Notes: Much like how the Centro debuted in domestic CDMA flavor prior to its global launch in GSM guise, a mildly updated GSM version of the 800w that, depending on the source, is schedule to launch simultaneously alongside the CDMA version or possibly later in Q3. Right now our best bits of information regarding this device are the slides from the leaked Vodafone presentation back in January. This device's rumored specs are identical to its CDMA brethren, aside from a flush-mounted touchscreen (another first for Palm). Presumably, this device would be a bit thinner and more stylish than the CDMA version and aggressively target a global audience less forgiving of clunky, chunky handsets than American IT managers. Notes: Unless something changes dramatically, this looks to be another Palm release that will not appear in the United States. The "Wanda" is expected to be a minor refresh of the ho-hum Treo 500 that appeared late last year. The main additions to the Wanda's spec list are integrated GPS functionality as well as much faster 3G HSDPA support (vs. the UMTS radio in the current 500). Otherwise, this device looks to continue its predecessor's notable lack of traditional Palm traits, as it omits the Athena Multi-connector, the top ring/vibrate switch and the traditional Treo "smile" keyboard. This device's release date is expected to still be sometime in September '08. Codename: Skywriter / Possible Product Name: "Centro-like device running WM 6.1" / ETA: Q3-Q4 ‘08? Notes: This is a new term previously unpublished prior to Tam Hanna's announcement last week. Several possibilities exist as to the exact identity of this this mysterious device. The codename "Skywriter" evokes the image of a lightweight, stylish device (ala Centro) designed around text messaging and e-mail. This product's codename is also strangely reminiscent of the old i705's "Skywalker" codename. 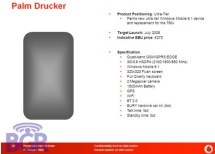 If we dwell on only the device's codename and the vague e-mail sent out to developers, then this simply might just be a new codename for the Drucker/800w GSM. If so, then developers would have a fairly easy time developing applications for a common set of hardware shared between two similar devices. Somewhat less likely but still possible is that Palm is readying a quad-band version of the Wanda for the US market for release this fall. This device might be introduced under the "Centro" branding as a cheap and easy follow-up to the Palm OS Centro designed to capitalize that product's momentum and early sales success. Then again, Palm might not want to create consumer confusion with two Centro models running two different OSes, with different hardware specs, connector types and screen formats. Finally, a much less likely scenario could have Palm releasing a new higher-end budget device combining the current's Centro formfactor and touchscreen with the more robust Windows Mobile 6.1 Professional OS. One advantage of introducing a low-end device under the Centro moniker would be the gain support for 3G GSM networks or EVDO Rev-A, Bluetooth 2.0, Google Maps' location and/or GPS capabilities and A2DP wireless headphone support, none of which is possible under the aging Garnet OS. However, Palm would be forced to likely offer such a device at higher price than the Garnet-based Centro due to Microsoft's Windows Mobile licensing costs…unless, of course, Palm and Microsoft have been able to renegotiate their licensing pricing in order to push more WM Pro-based devices to the lower end of the smartphone market. If Palm could hit the ground running this summer and fall with two 320x320 WM 6.1 smartphones, they would enjoy near-exclusivity in this particular segment (WM 6.1 320x320 touchscreen w/ full QWERTY keyboard) of the market, though a cheaper touchscreen WM Centro could potentially steal sales from the flagship Treo 800w, risking further dilution of the Treo line's cachet. Is there such a thing as "Palm faithful" nowadays? Not on this site. Try Brighthand or PalmAddicts. We (I) remind me of fishing for Crappie in Weiss Lake, AL last weekend. Those minnows started sucking air and got more and more sparse as the day went on. Faithful? I don't think so. More like a few remaining minnows desperately clinging to the remaining oxygen (Palm OS devices), while seeing the probable end, but hoping for a miracle. Something like that maybe?!? C'mon little fat 680, can you make it another year? Looks like at that point it will be breakthrough or sell the furniture. I'm afraid to say which is more likely. I'm still faithful to my Palm TX running Palm OS. It's just too bad Palm isn't faithful to any Palm OS. Yippee more Windows Mobile devices, the world just can't have enough of these. Is it really a Palm when they technically don't make the hardware and the don't make the software? The only thing that's truly Palm on these devices is the shape and the sticker. If you want to be faithful to a sticker then be my guest. 2) Keep hoping that there will be some rumor or spy shot of that next Palm device that is a worthy successor to the POS devices of 3 years ago? I was a Palm user from the U.S. Robotics Pilot 1000 I bought in June of '96 to last year when I stopped using my T3/T610 and bought a Nokia e61. I still come here because my ideal device would be a modern Palm smartphone, and I hope it is created some day. The Nokia has a modern OS (doesn't crash) but is weak on the sync side and doesn't support any PIM except Outlook. I also remember the heyday of the Palm developer community and would like to have a device with that kind of support again. Maybe I'll end up with an Andriod phone.